DEMA Y-type line strainers are the simple yet critical component for use in waterlines ahead of solenoid valves, chemical injectors, spray nozzles, or many other types of equipment. The Y-type strainer removes foreign matter from the water (or other fluid) line and keeping it out of the valve / equipment ensuring proper operation of the equipment and adding significant operating life. 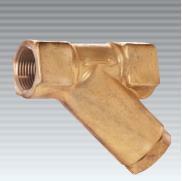 DEMA'S strainers are available in forged brass, cast bronze or Delrin construction.